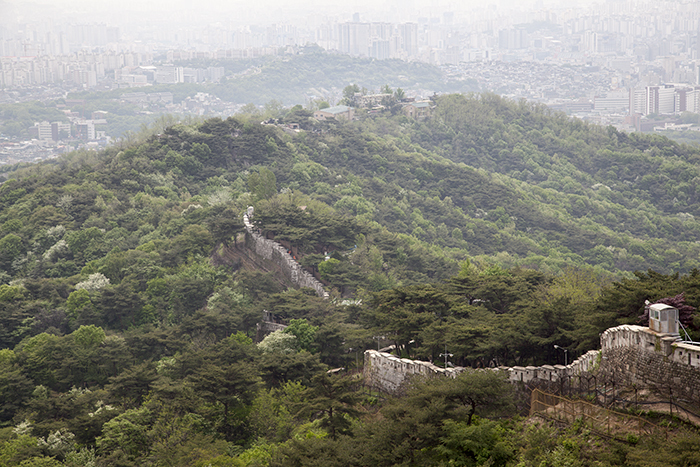 One thing I learned during my pre-trip research is that hiking is a huge pastime in Seoul. The city is a sprawling metropolis, but the surrounding mountains provide myriad hiking opportunities. 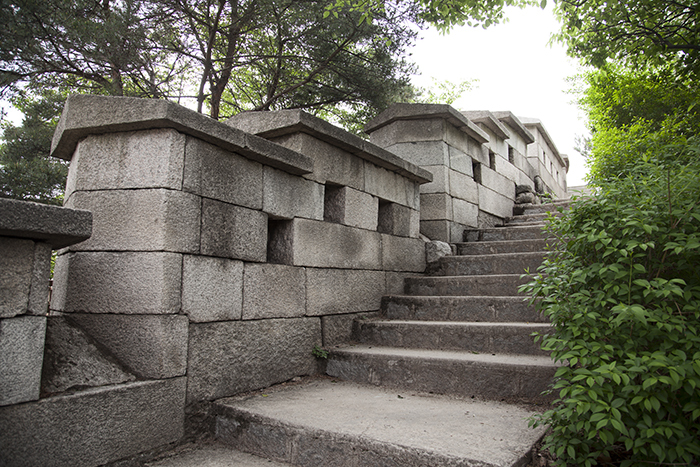 I took advantage of the so-called Seoul Fortress hike, mostly due to its close proximity and the history behind it. 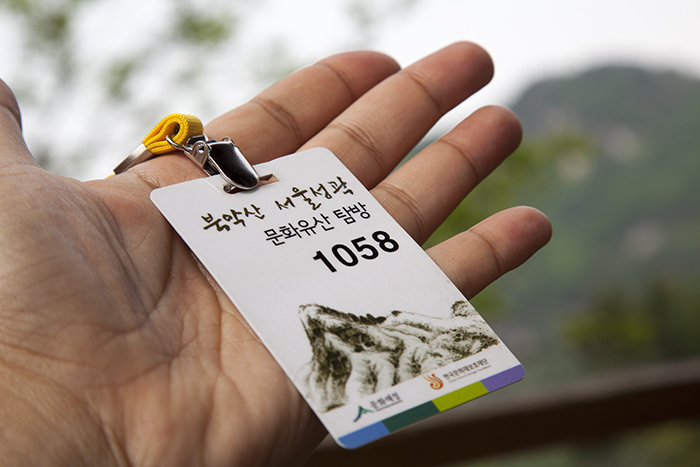 The main part of the hike traverses Bugaksan, a mountain to the north of Seoul that overlooks the President's official residence (Cheongwadae or the "Blue House"). 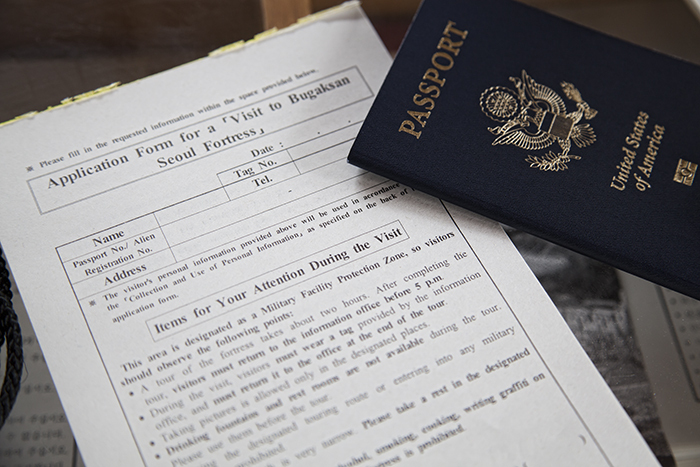 Because of security concerns, you have to fill out an application and provide some identifying information to enter. 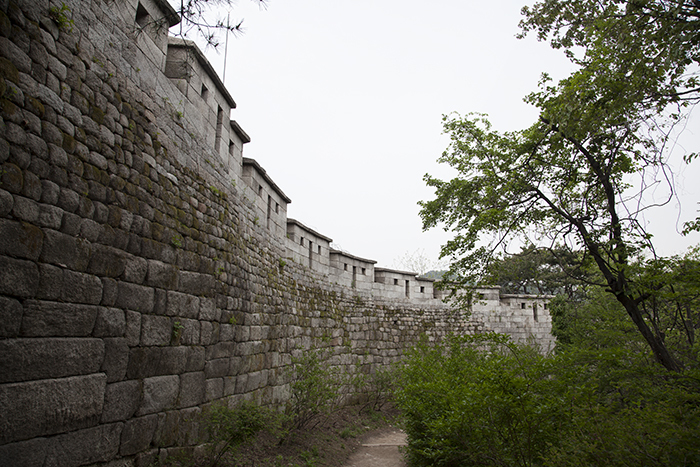 You spend pretty much the entire hike on the old Seoul Fortress wall. It's an interesting peek into the city's history. 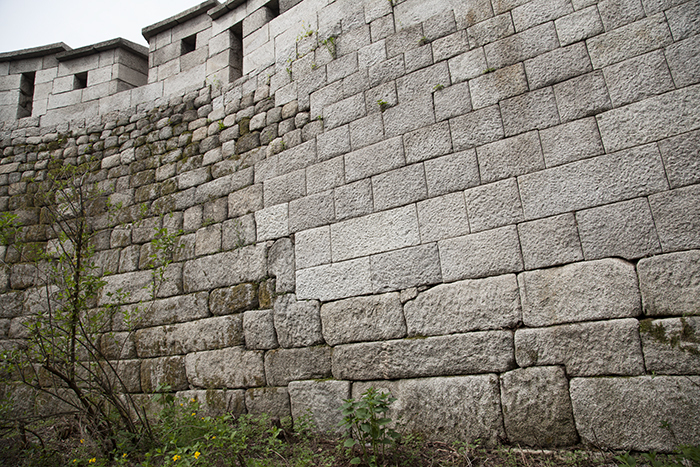 You can even see where wall-building technology changed. Or perhaps these are sections of the wall that were later rebuilt. 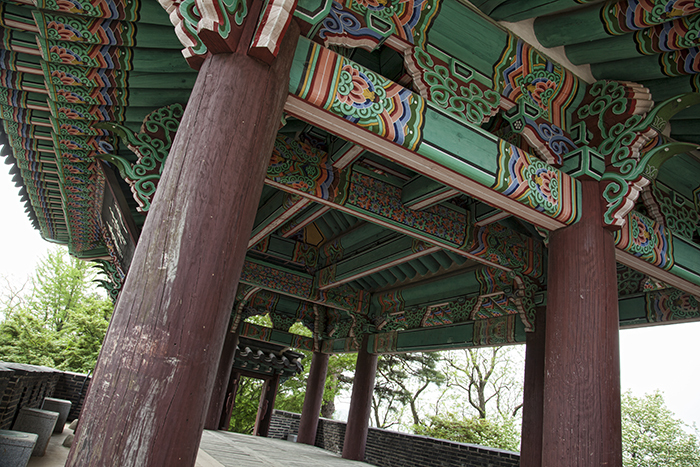 Soon into the hike, you come across Sukjeongmun, the great north gate. I already posted a photo of the gate's exterior in a previous post. Here, you can see the gate's interior. Unlike the other gates around the city, you can actually go inside. Bugaksan provides fantastic views. Unfortunately, photography is mostly prohibited due to the high security—there are guards stationed at regular intervals. With that in mind, I'm not sure how I managed to capture the shot below. You can see the section of wall that I had already hiked. 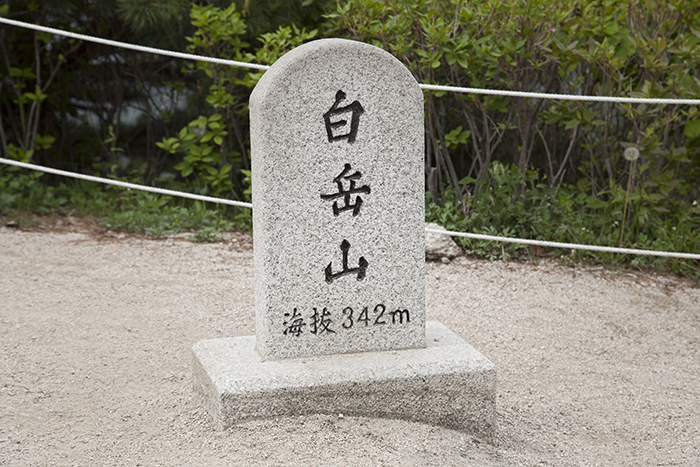 This stone marks Bugaksan's 342m peak. Don't worry. The guard at this spot indicated that photography was allowed. 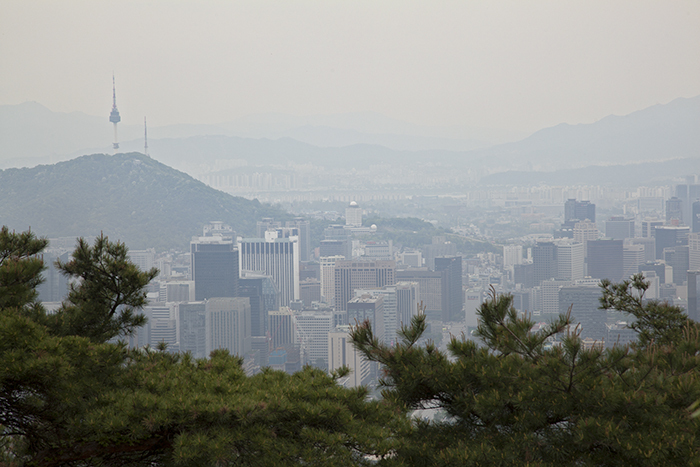 The peak had a nice view of Namsan Tower to the south. The descent after the peak turned out to be very steep. I'm glad I did the trail east to west instead of the opposite direction. The map below shows the basic route. 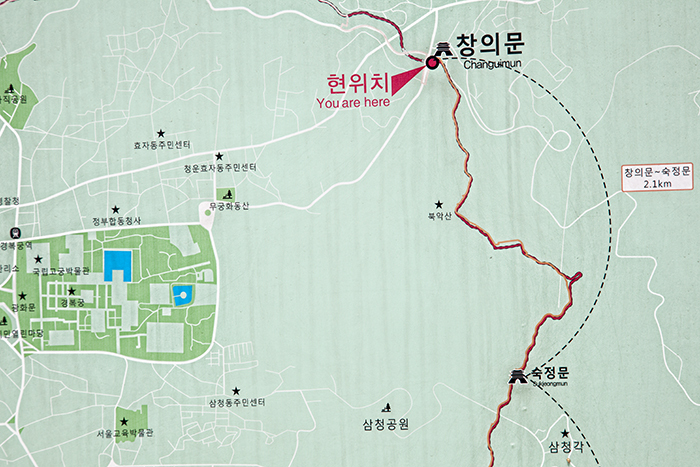 I started at the white line (road) just below the gate at the bottom (Sukjeongmun) and ended at the gate up top (Changuimun).